PS be careful opening article at work or in the company of others. According to this link that I found in the Weather Channel Website that Uranus smells like Smells Like Rotten Eggs and getting the jokes in the Science Community of lately. Wickramasinghe and Hoyle also happened to be responsible for another space biology thesis. Only this one is based on more than just the origins of organic chemistry. The Hoyle Wickramasinghe (H-W) thesis of Cometary (Cosmic) Biology makes the rather simple claim that the direction of evolution has been significantly affected by biochemistry that didn't start on our planet. In Wickramasinghe's own words, "Comets are the carriers and distributors of life in the cosmos and life on Earth arose and developed as a result of cometary inputs." Those inputs, Wickramasinghe argues, aren't limited to a generous sprinkling of space-baked amino acids, either. Rather, they include viruses that insert themselves into organisms, pushing their evolution into whole new directions. The report, titled "Cause of Cambrian Explosion – Terrestrial or Cosmic? ", pulls on existing research to conclude that a rain of extra-terrestrial retroviruses played a key role in the diversification of life in our oceans roughly half a billion years ago. Thus retroviruses and other viruses hypothesised to be liberated in cometary debris trails both can potentially add new DNA sequences to terrestrial genomes and drive further mutagenic change within somatic and germline genomes," the authors write. Let that sink in for a moment. And take a deep breath before continuing, because that was the tame part. It was during this period that a group of molluscs known as cephalopods first stretched out their tentacles from beneath their shells, branching into a stunning array of sizes and shapes in what seemed like a remarkably short time frame. The genetics of these organisms, which today include octopuses, squid, and cuttlefish, are as weird as the animals themselves, due in part to their ability to their ability to edit their DNA on the fly.The authors of the paper make the rather audacious claim that these genetic oddities might be a sign of life from space. Not of space viruses this time, but the arrival of whole genomes frozen in stasis before thawing out in our tepid waters. "Thus the possibility that cryopreserved squid and/or octopus eggs, arrived in icy bolides several hundred million years ago should not be discounted," they write. In his review of the paper, medical researcher Keith Baverstock from the University of Eastern Finland, concedes that there's a lot of evidence that plausibly aligns with the H-W thesis, such as the curious timeline of the appearance of viruses. They note further research is needed, but this is a peer edited scientific journal and not some pay for publication vanity press. But just in case, maybe we should start preparing for the return of the Great Old Ones from space...just saying! I don’t understand how that review could have been published at all. I even checked the date of publication to make sure it wasn’t April 1. Anyhoo... the review surveys the literature and cherry picks points that it then interprets as favouring its panspermia fetish. Claims that cephalopods have a genome that is in any way “weird” are ridiculous. There is nothing weird about cephalopod genomes, nothing that suggests they might have an origin different from any other branch lf the tree of life, and nothing that requires an alien intervention. The very concept of an alien virus is ridiculous... how could an alien virus be in any way compatible with terrestrial life? It would have had to evolve from the same mechanisms and produce the same type of biochemistry, down to the very same genetic code. It’s as if a first message from space, originating from a totally alien civilization, was written in English. Alien viruses are a nice theme for scince-fiction stories, but in the real world even Earth-born viruses have a hell of time crossing the species barrier, even between closely related species... imagine a cross-planetary barrier! Tardigrades are often mentioned when panspermia comes up... but come on, they’re not that weird. They just have different ways to resist slow dehydration (which comes in handy since they are often in conditions where they dehydrate), and accordingly they can survive for a certain time in space. I wouldn’t expect to survive an interstellar journey, though, and that holds doubly true for viruses exposed to solar radiation. Panspermia is an intriguing hypothesis, but its adherents have a huge burden of proof to deal with! ..."This is the first time we've found dinosaur material preserved in amber," co-author Ryan McKellar, of the Royal Saskatchewan Museum in Canada, told the BBC News website. 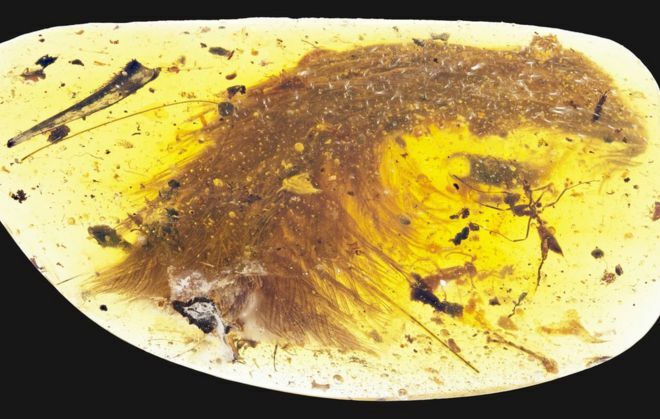 The study's first author, Lida Xing from the China University of Geosciences in Beijing, discovered the remarkable fossil at an amber market in Myitkina, Myanmar. Lida Xing was able to establish where it had come from by tracking down the amber miner who had originally dug out the specimen. Dr McKellar said examination of the tail's anatomy showed it definitely belonged to a feathered dinosaur and not an ancient bird. "We can be sure of the source because the vertebrae are not fused into a rod or pygostyle as in modern birds and their closest relatives," he explained. "Instead, the tail is long and flexible, with keels of feathers running down each side." Dr McKellar said there are signs the dinosaur still contained fluids when it was incorporated into the tree resin that eventually formed the amber. This indicates that it could even have become trapped in the sticky substance while it was still alive. Co-author Prof Mike Benton, from the University of Bristol, added: "It's amazing to see all the details of a dinosaur tail - the bones, flesh, skin, and feathers - and to imagine how this little fellow got his tail caught in the resin, and then presumably died because he could not wrestle free." Examination of the chemistry of the tail where it was exposed at the surface of the amber even shows up traces of ferrous iron, a relic of the blood that was once in the sample. A new discovery in Utah of a mammalian skull among other fossils has leas to a rethinking of the early migrations of mammal and the theories on the break up of the super-continent Pangaea. This evidence is leading some to theorize that Pangaea may have broken up some 15 million years later than originally thought and that there was more diversity in early mammals than thought before they became the dominant species. My brother DP went to Yellowstone on Vacation and discovered on June 4th -- that Steamboat Geyser erupted multiple times and here's the link to an article by Yahoo that's explains everything. He's quite nervous and I don't know whether he and his wife are sticking around after that incident. I told him to leave and haven't heard from him yet. Scary ... if this SuperVolcano Erupts -- It will be a super-disaster of super-disaster in the making. I'm quite sure he's fine. However, if Yellowstone blows I'm deader than a doornail. Really interesting and potentially exciting news for the quest for extraterrestrial life. "Some believe there may yet be brothers of man... who even now fight to survive - somewhere beyond the heavens!" Love that opening monologue and the mysterious music and cool space visuals that accompanied it. It had a certain “Chariot of the gods” quality to it. I loved ancient astronauts stories! THIS is the way to talk about science, as far as I'm concerned!!! What a great role model that woman is!!! Would anyone not want to be a scientist after listening to that talk? (The direct video link doesn't seem to work... bummer).